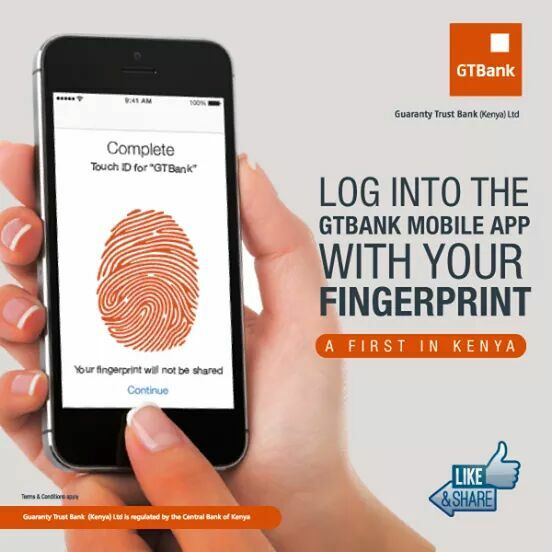 GTbank mobile app uses fingerprint technology to transact. 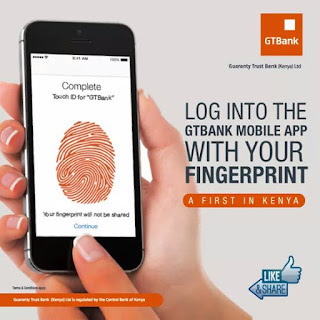 @GTbankKenya GTbank kenya formerly Fina Bank has introduced the fingerprint technology in its mobile app.The first in kenya,GTbank mobile app recognises your fingerprints which then acts as your password to access your GTbank account and thereby make transactions anywhere. 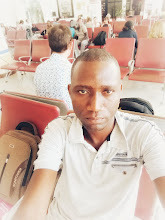 Fingerprint technology which have been widely used in the developed world provides absolute control of your bank account thus reducing fraud from thieves and even your own relatives. GTbank mobile app allows the account holder to do a lot of transactions on the go like buying goods and paying for utilities. The banking sector in kenya is heavily competing in coming up with new technologies to revolutionize service delivery.Last week, the Family bank launched mVisa while DTB launched a digital branch in Nairobi in March this year.